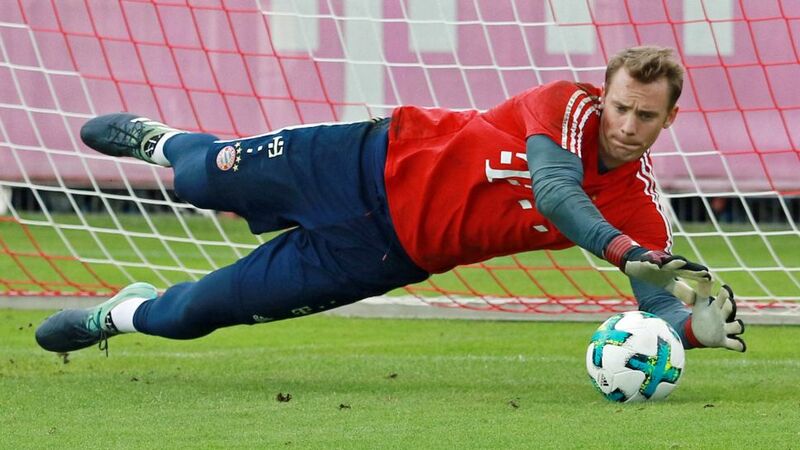 Star goalkeeper Manuel Neuer made his first saves in more than six months on Thursday as the Bayern Munich and Germany number one enjoyed a first training session with the ball as he continues to work his way back to full fitness. Neuer had previously been restricted to jogging in recent outings at Bayern's Säbener Strasse training complex as he continues his recovery from a fracture in his left foot that has sidelined him for virtually the whole season. However, the 32-year-old was finally able to get his gloves dirty as he was put through a testing goalkeeper-specific session. While his team-mates jetted off to Spain ahead of their the UEFA Champions League quarter-final first leg win at Sevilla FC on Easter Monday, the Germany number one had taken the next step in his comeback by running in boots having first stepped back out onto the training pitches the previous week for a gentle jog. "Wonderful! First time out…" Neuer had written in a post to accompany a video shared on his Facebook page that showed him heading out of the training centre door before giving the camera a thumbs-up ahead of his first public training session of any kind since being sidelined in September. Neuer, who missed the last five Bundesliga games of the 2016/17 campaign due to the initial fracture, returned to play three matches early this season before again being confined to the role of spectator as Bayern have marched towards the title. In a recent interview with bundesliga.com, the former Schalke man revealed his ambition of playing again for his club this season before heading to Russia to try and help his country retain the FIFA World Cup. "My aim is to play a few games again for Bayern, but the important thing is nobody is putting me under any pressure," explained Neuer, who has seen his understudy, Sven Ulreich, deputise brilliantly. "They're giving me all the time in the world, albeit hoping to see me back on the field again soon. Getting back into the national team with a few games under my belt is my objective."